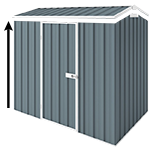 This skillion roof Durabuilt EasyShed model offers you extra head room at your shed front and added depth, compared to flat roof sheds. This skillion roof EasyShed model offers you extra head room at your shed front and added depth, compared to flat roof sheds. It gives you additional storage space yet still remains compact enough to fit into small backyards. Wall height is 2.1m at the front and 1.73m at the back. It comes in a variety of colours to choose from so you can be sure that you'll find one that suits your circumstances the best. Shed come with 20 years warranty. Please check out the wide rage of accessories available with this model below to customize your shed even more to your needs. Once I identified all the components assembly was straightforward though I had some issues after panels were joined in accordance with the instructions and then came to attaching the U-channel trim strips. Screws used to join the edges of the panels impeded attachment of the U-channels. I overcame this by removing the screws on the edges, predrilling holes in the U-channel to line up with the original holes and then reinserting the screws to secure both the channel and the sheets. Similar problems were encountered once the roof was assembled. Attaching the roof to the side panels saw the same problem. Where possible the screws were again removed, holes in the roof side trim predrilled and screws reinserted. As per the suggestion in the assembly instructions I also backed up the screws with pop rivets as the screws tended to strip easily if too much torque was used on the driver drill. I found the shed easy enough to assemble once I identified all the relevant components. Actually assembly however created a few problems that had to be addressed in hindsight. When following instructions to assemble the individual panels problems were encountered where top and bottom rail trim was added to the panels. Screws used to join the edges of the panels as per the diagrams then hampered fixing of the trim. I overcame this by removing the edge screws, predrilling holes in the trim to then line up with the hole and reinserting the screws through the trim and panel material. This problem was also encountered when assembling the shed, particularly attaching the roof. Once again, where possible, screws were removed so that they could be reinserted to secure all components once lined-up holes were drilled. The thin material also meant that it was easy for the screws to strip the material if too much torque was used on the driver drill. This was overcome after some trial and error though a reminder in the instructions to use a lower torque setting might help.